A group of 20 students walked in a Generation graduation ceremony on Veterans Day weekend at the Kids Hope Alliance in downtown Jacksonville. These students come from partner organizations the Wounded Warrior Project and the Carpenter Shop Center, joining local non-profit Generation’s employment program to gain the technical skills to train them for careers in customer service. They join a Generation Jacksonville alumni network of more than 700 and a global network of more than 21,000. Generation Program Coordinator, Lauren Pfanenstiel, learned about the Wounded Warrior to Work program in early September and connected with Tyrinda Dixon, Warriors to Work specialist. Dixon shared many veterans struggle to get work for a variety of reasons, from networking with employers, to health reasons like PTSD or having physical limitations. “Generation Jacksonville has been a beneficial tool for our Wounded Warriors and families,” said Dixon. “The classroom interaction, job coaching, and workforce development have certainly made a huge impact in the lives of those who participated in the recent cohort. Their innovative thinking and community engagement is setting the bar for organizations who are willing to support our Warriors and their family members. I look forward to continued involvement with Generation Jax!” she said. Graduates in the Customer Service Supervisor program complete an intensive 6-week “bootcamp-style” program that integrates technical training along with behavioral and mindset skills, which helps students prepare to overcome both workplace and personal challenges. After completing the program successfully, graduates in this CSS program have jobs lined up at Florida Blue, Fanatics, Amazon, YMCA, Anheuser-Busch, and Bridgestone Tires. “When I arrived at Generation I was just a lost veteran wondering ‘where do I go from here?,’” said Lawrence Chandler, Wounded Warrior Project veteran and Generation graduate. “I was instantly shown my potential I didn’t know I had. With the knowledge and confidence I gained, I feel prepared for the next chapter. Thank you Generation for helping me find myself,” he said. Another Generation partner, The Carpenter’s Shop Center, is an afterschool program dedicated to serving the whole child, including parents and families. The Carpenter’s Shop Center has four graduating students in this class and has partnered with Generation by offering space for class and outreach assistance to families in the community. Funded by a grant from Walmart, Generation serves a population of young people for whom the existing education-to-employment system has not worked. Programs focus on empowering individuals who have faced significant barriers in their lives and life challenges, including those as basic as transportation and child care. To allow Generation students to manage their lives during training and focus on learning, Generation helps provide, if needed, assistance for transportation, occasional meals, and access to other wraparound services. 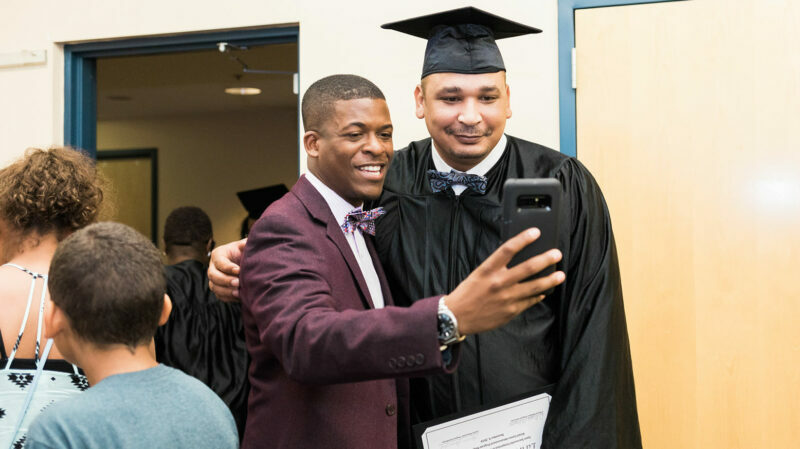 To ensure a holistic approach to empowering and uplifting Jacksonville citizens, social support and mentorship is available to all students throughout the course. Generation ensures that graduates continue to have access to support and regular follow-up contact for the first six months of their employment. To date, more than 300 students have graduated from Generation’s CSS program in the past year. Together with a range of partners, including a coalition of 20+ local businesses, non-profits, and providers, Generation’s classes provide Jacksonville young adults accelerated training as call center agents, retail workers, and customer service representatives.